London Bridge has a history of moving to the West, whether by a few feet or several thousand miles1. In this new work, artist Simon Pope has invited architect Charlie Mackeith to relocate London Bridge, moving it upstream on the River Thames, taking the memory of the current bridge with them on a day's walk, recalling it - rebuilding it - and in doing so, founding a new city, a new London safe from the rising tide. On Tuesday 19 June at 7pm, as part of Architecture Week, Simon Pope and Charlie Mackeith will discuss London Bridge Recall. Talk will take place in the gallery and booking is essential. 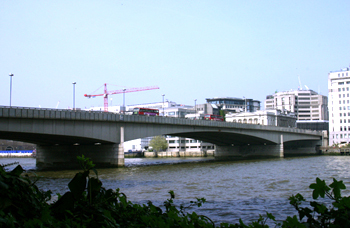 Remnants of previous London Bridge can still be seen on the South Bank of the Thames, just downriver from the Bridge that is now crossed daily by hundreds of thousands of commuters. The bridge with which we are so familiar, as a direct route from the Kent bank into the City of London, lives a relatively mundane existence, compared with that known through children's song and legend. We are all familiar with the nursery rhyme, London Bridge is Falling Down; we can picture, in our imagination, the old bridge, stacked high with shops and dwellings, that perished at the time of the Great Fire; equally, we know of the fate of one of the subsequent London Bridges, shipped across the Atlantic, relocated as a folly. Legend has it that the gullible buyer, Robert P. McCulloch, was duped into buying London Bridge, sight-unseen, imagining that it was it glamorous, ornate Victoria counterpart Tower Bridge. This perhaps suggests that recent London Bridges have been less memorable others, never taking the form worthy of its name. It stands at the initial lowest bridging-point on the Thames - a hugely significant position symbolically as well as practically, determining the shape of London since its founding. What if, as some would have us believe2, the lowest bridging-point were to have to change, in the face of a rising tide? What if London was no longer centred on this most practical yet symbolically charged structure? What would happen to the City if this bridge, bound so tightly into the founding of the City itself, were moved? This new work invites an architect to relocate the bridge, moving it upstream and in doing so, founding a new city, a new London safe from the rising tide. A photograph and an audio recording of the recall event will be made available online; a public presentation of the work will be made in Central London. Both the Walk and Talk events take place during Architecture Week 2007.